Here you go, a brief review on being the first to watch Pirates of the Caribbean: On Stranger Tides in Malaysia. Watching a full length movie in 3D was kinda interesting but I'd have to admit it was quite an agonizing experience. All of us were required to surrender our mobile phones & cameras prior to entering the cinema hall; a compulsory rule to adhere to for all preview screenings. Then we were given a pair of stylo-mylo 3D glasses to put on in order to enjoy the 3D effects. At first, it was comfortable when the movie began. Thirty minutes later, my ears started to ache due to prolong wear. I ignored the pain & continued watching but trust me, the pain became unbearable. 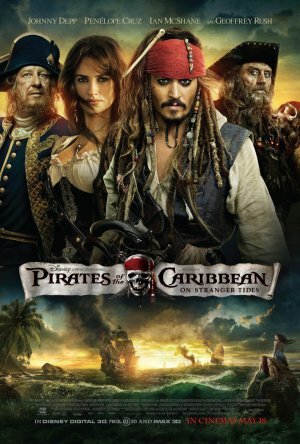 As for the movie, it was good to see Johnnny Depp reprised his role as Captain Jack Sparrow & not to forget some new characters added to the plot keep audiences interested. It was no doubt entertaining but somewhere in the corner of my mind kept on bugging me that this movie lacked the sparkle. It lacked the exhilarating feeling that I always had when watching the previous instalments. If At World's End is your least preferred choice, On Stranger Tides is not any better.